Being a fairly new resident to Roxborough, I was excited to sit down and talk with longtime residents and cowriters Flo Tonelli and Char Nauman of Images of America, Roxborough. I met Char at the door of the Roxborough Park Community Center. We headed inside and found a good spot to sit down for the interview. Moments later, Flo walked in singing happy birthday and carrying a potted flower for Char. “This is why working with Flo is so great,” Char explained. Char Nauman first saw Roxborough under the evening sky. She and her husband were looking to buy a lot and build a home in Roxborough and they were immediately sold after gazing over the downtown Denver skyline. Less than a dozen homes made up Roxborough Park when they officially moved there in 1973. Char and her husband had two teenage girls when they moved to Roxborough. “Back then the school bus only came to the entrance (pg 93) because the paved road ended there,” Char explained. Her girls would ride the family motorcycle down to the entrance and store the bike in the gatehouse until the school bus dropped them back off at the entrance at the end of the school day. Char said a 4×4 was later purchased so that the girls could get to the bus stop during the snowy season as the roads weren’t plowed back then. Every Sunday Flo Tonelli would take a drive all over the Denver area. One Sunday she drove down to Roxborough after she had read something in the newspaper about a park being established (Roxborough State Park). As the red rocks came into view, Flo knew right then and there that she wanted to live in Roxborough. But she would have to wait as she and her husband decided that it was too remote for their young children. Many years later, Flo’s prayers were answered. On the day their youngest son graduated from high school in 1993, they moved into their Roxborough home. If you had to pick only one thing that you love the most about Roxborough, what would it be? Char: The rocks! Everything about them. Flo: The rocks and how they change in the light and during each season. What were your goals and intentions in this book? 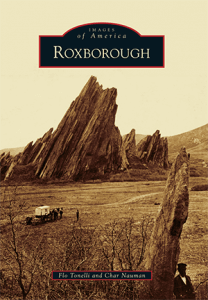 Char: Someone needed to share the history of Roxborough. My first instinct was to share the stories of Roxborough Park community members but in order to get it published we broadened the scope to include all of 80125. Flo: Suburbia is going to catch up to Roxborough and we needed to preserve the history. We have to remind people of Roxborough’s past. There are some amazing images in this book. Where did you get all of the images and the information to accompany them? Flo: I was more familiar with the resources (due to her profession). The Colorado History Museum had a lot and that is where we found this image (she points to the cover of the book). Rusty Simon was a neighbor of mine when I lived in Columbine. He actually grew up in Roxborough and was an amazing resource. He had great stories. Rusty would ride his horse for miles just to go play cards. Char: Flo would get a story and I would find a photo to go along with it. Char: The photo of the mailboxes under the apple tree (page 91). It was like a landmark back then. I don’t know if it’s my favorite but it brings back wonderful memories. Flo: There were so many photos that I just sad, “WOW.” We came across photos that we had never seen before. I remember getting so excited about seeing a photo and figuring out what it was and where it was. The photos of the Platte Canyon Reservoir (pages 36 and 37) are my favorite. The construction was all done by hand. When I go by that lake now it gives me a whole new perspective. It was all built on manpower. What was the most surprising thing you learned while creating this book? Flo: How hard it was! I thought it would be easy. Char: Getting organized. It took two months to get organized. Flo: It was a different kind of writing for me. Taking all this information and putting it into fifty words was difficult. What piece do you take out? Char: We couldn’t say it all. We had to be selective. Flo: We thought it would take five to six months but it took one year to finish the book. Char: Finding the history – things that I wasn’t aware of. Flo: The story telling. I love to hear people’s stories. Char: When you have that personal touch it makes it more special. People’s dreams that they were trying to achieve. They weren’t completed but then someone else would come in with their own dreams. Flo: Roxborough was very remote. Just picturing that, hearing the difficulties and knowing they persevered. Over the next twenty years, Roxborough will go through a very dramatic change with the addition of 12,000 new residents. What are your thoughts on this? Char: We want to keep it just the way it is but that’s not going to happen. But, I feel comfortable the way they are doing it. It’s the best way. I think the developers are community aware. You don’t find that a lot. It’s going to have its downsides but they are making access to parks and community centers and I’m hoping the community will benefit from it. Flo: The developers are a 5th generation family. I was shocked that many of the leaders in the Roxborough community were supportive of the change. There’s good news and bad news. I’m sad about the vanishing prairies. But there will be everything a suburban community has. You can never be the last settler. These people are the new pioneers but they sure don’t fit the same silhouette as the old pioneers. The hour-long interview with Flo and Char flew by. I could have easily asked them to recite millions of more stories from Roxborough’s past. They are wonderful ladies that have given our community a gift that many take for granted. History can easily be forgotten but Flo and Char captured it wonderfully in their book. Every Roxborough resident should own this book. You can purchase on Amazon.com, Arcadiapublishing.com or contact them directly at naumancm@aol.com and/or aftonelli@comcast.net. 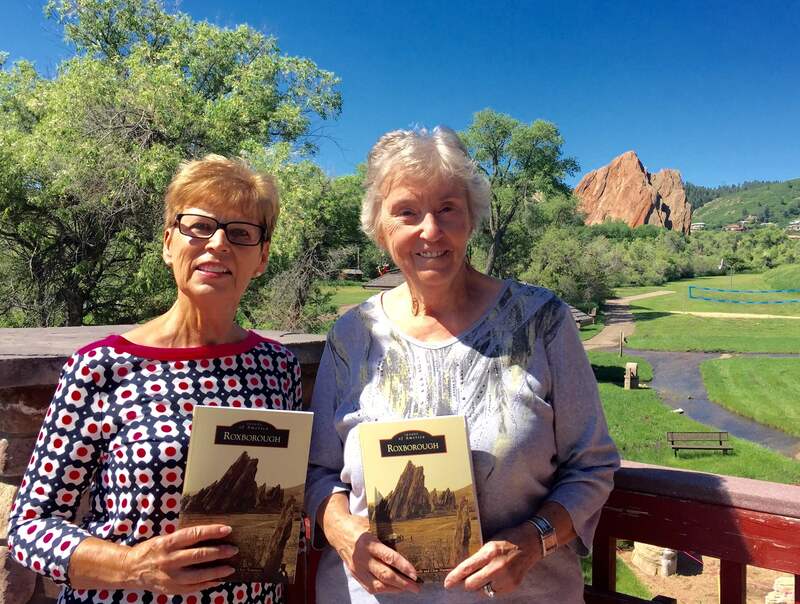 Also, stay tuned for information on their book signing in August at Tattered Cover Book Store in Aspen Grove.